If you thought the influx into Cuba of Barack Obama, Mick Jagger and other opportunists into Cuba this past week meant political repression on the island had become a thing of the past, you'd be sorely mistaken. Instead Easter Sunday brought more of the same, with reports from the island that at least 30 Cuban Ladies In White had been arrested. I will leave it to the CNNs and the New York Timeses to report on the "historic" nature of President Obama's dalliance in Cuba -- a few hours in, some of it already is hysterical. Instead, this blog remains committed to telling the truth of what is happening in Cuba today. For instance, a few hours before Obama and his entourage landed in Havana, it was just another Sunday in Cuba, with opposition activists taking their protests to the street, and the dictatorship's police and other goons delivering another round of brutal beatings and arbitrary arrests. Dozens of arrests were reported. That the regime has no problem again showing its true colors, despite more cameras than usual capturing the repression, demonstrates it's important to take the dictatorship at its word when it says that despite Obama's promises of hope and change, it has no intent of changing anything. Of course, Obama is only interesting in cementing his legacy -- as what, I'm not sure -- and demonstrating to the American people that it's OK to vacation in Cuba and to spend the money that helps pay for what is documented below. A Cuban police officer arrests a member of the Damas de Blanco, or "Ladies In White." The Cuba President Barack Obama will visit this month has in 2016 suffered some of the most brutal repression in the past decade. 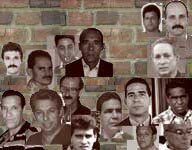 The Cuban Commission on Human Rights and National Reconciliation this week reported it had counted at least 1,141 political arrests in February, the third-highest tally since January 2010, surpassed only by the 1,447 arrests in November 2015 and 1,414 in January. The count so far for 2016 -- at least 2,555 -- is almost a third of the 8,616 arrests recorded in all of 2015. Raul Castro, not Barack Obama, is responsible for the repression suffered by peaceful opposition activists and others in Cuba. But Obama is not absolved of culpability because his capitulation to the dictatorship on human rights issues so that American tourists can hit Cuban beaches and he can build his legacy -- as evidenced by his silence and inaction as the regime cracked down even harder -- has been received as a signal in Havana that there will be no price to pay. The president has a chance to come down on the right side in Cuba, by using his visit to the island to highlight and embrace those brave Cubans who each day and each week take to the streets to demand democracy, freedom and a respect for human rights. If he does -- and Secretary of State John Kerry's decision to cancel his visit in advance of Obama's suggests he might be planning to -- I will be surprised. But then I will applaud him for delivering such a powerful blow to tyranny. And if Obama doesn't, it guarantees there will be in Cuba many more months like February.